Percussion Lab is a 24/7 stream of underground electronic and hip hop music. Every month they feature live and DJ sets by established and up and coming artists and DJs. They also output podcasts in the iTunes Music Store. 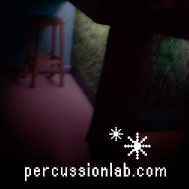 Percussion Lab began in the Summer of 2002 as a radio show on the local upstate New York Independent radio station, WVKR. Hosted by Praveen and featuring the talents of turntablists Killa K and Lord L, the show consisted of Electronic and Underground Hip Hop music for a new kind of beat generation. In between events, Percussion Lab streams direct from the 'Lab 24 hours a day, seven days a week as "Percussion Lab."